On behalf of the CIRPA Board, we are proud to recognize Peter Seto as the recipient of the Outstan ding Service Award. Peter spent many years as the Director of Institutional Research at Mount Royal University, and was one of the early founders of the Association. During that time, Peter spent 8 years on the CIRPA Board, serving two terms as Vice-President. He was a lead organizer for CIRPA 2009 (Banff) and served on the programming committee for the Halifax conference (2015). Peter also played a key role organizing local IR groups in BC and Alberta and was a founding member of the Alberta group (ABIR – pronounced “A beer”!). At conferences, Peter often played the role of the Pied Piper dragging people out to discover fantastic local and international musicians. It was great to reconnect with him in Calgary, as he has been deeply missed since retiring from the profession. 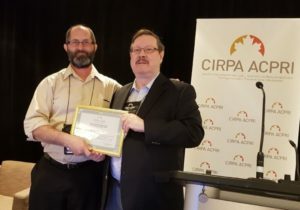 Thank you, Peter, for your many contributions to CIRPA over the years! 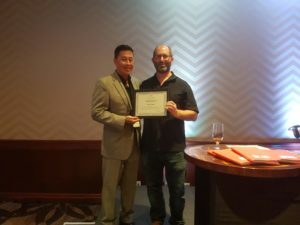 At CIRPA Toronto 2017, we recognized Brian Christie (University of Regina) for the Outstanding Service Award. Brian is one of the founders of CIRPA, who has been part of the Association from Day 1. He personifies dedication to the association, through his commitment as an organizer, presenter, and mentor to his team and other IR professionals. Thank you Brian for spending the past 25+ years building and supporting CIRPA. In 2016, we recognized the contributions made by Luc Simon of Université Laval. Luc has played a very important role in the Association, serving four years as a member-at-large on the Board of Directors (2010-2014) where he led the redevelopment of the CIRPA website. Luc also chaired the 2008 conference in Québec City which had unsurpassed food and entertainment, in a truly beautiful city. For those who regularly attend the CIRPA conference, you’d also know him as a regular presenter on data mining and analytics and sharing interesting ways to use Tableau. Join us in congratulating Luc for being a pillar within the IR profession, and continuing to model excellence in institutional research. (current) and Cameron Tilson, Concordia University. Consult the President’s message for more details.